Today Joshua and I attended our Friendsgiving with some great people we’ve gotten acquainted with while living in Johnson City. It has taken some time for me to get used to living away from home! One thing that has helped me transition is getting to know some great people that we get to socialize with from time to time. With this being the time of year to express thanks, I’m thankful friends! 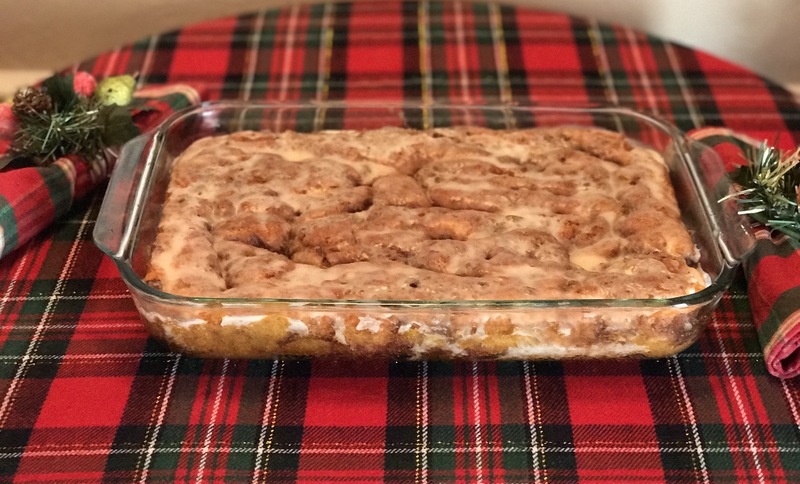 For this brunch we had breakfast casserole and deserts, so I whipped up a Honey Bun Cake. My mom is the queen at making this, so I stole her recipe. It’s easy and so so yummy. Mix all these indlgredients together in a medium size bowl. Pour half the batter into your baking dish and set the other half to the side. Sprinkle half of this topping onto the batter in the dish. Add the rest of the cake batter on top of this, then sprinkle the remaining topping on the very top. Take a spoon and swirl the topping into the batter vertically and horizontally. Mix together and drizzle over cake while it is still warm.